Barbara Sobel worked for Leo McCarthy from 1987-1994. She started as a volunteer on his first US Senate race and moved to the Lt. Governor’s office where she served first as a field representative and later as a member of senior staff team as director of special projects. She is now a clinical nutritionist in private practice. While she no longer works in the public sector, you can find her making calls, walking precincts, and supporting candidates she believes in. One of the things she is most proud of is raising two sons who would never miss a chance to vote and have their voice heard. In 1987, I graduated from UC San Diego with a degree in political science and I joined Leo McCarthy’s US Senate campaign in Los Angeles as a volunteer that summer. Leo walked in the office a few days after I started, put out his hand and said I am Leo McCarthy, what is your name and then he welcomed me in. Within a few weeks I was promoted to receptionist and then quickly after that I joined the fundraising team. For the next year or so, my job was to work in a cold windowless office with Leo McCarthy as he did what we then called “phone time”. He would get a stack of call sheets from the campaign team of people he was supposed to call and why he was calling them. I was to make sure he made the calls and then I would get the follow-up information to the right person on the team. I coordinated my efforts with my counterpart in San Francisco. We did a lot of faxing back and forth in those days. At first it was a nerve-wracking job and was so out of my comfort zone. Here I was a 23 year-old working all day closely with the Lt. Governor of California. Over time however I began to relax and feel like I had won the career lottery. I would hand Leo a call sheet and as I dialed and got his caller on the phone, he would talk to me about them, who they were, their history with him, their key issues and interests, and the would tell me their story and in the process teach me about California’s political story. We called legislators, business leaders, entertainers, activists, clergy, academics, old friends, and donors. It was an education I could have never dreamed of. I realized early on how fortunate I was to work for someone who felt such a responsibility to mentor and teach me. One day, he called me in his office, sat me down and asked if I would be willing to explain my thoughts on parental notification for minors on abortion. We sat and talked through my perspective as a young woman not too far out of high school and he asked very thoughtful and thought-provoking questions. He asked me into his office because he truly wanted to understand my perspective. Like with other issues he sought to get below the surface, to really understand how policy changes would affect people’s lives. My perspective was not the only one he sought on this issue, but it was reflective of how he approached making decisions. Leo McCarthy talked everyday about the importance of making a difference in the lives of others. He followed that talk with actions as a public leader, an individual, and as a mentor. When he did not have lunch meeting, he would gather up the staff and we would all sit and have lunch in a big circle. I can remember him talking to us about how good policies are made from understanding and compromising on all sides. I have repeated this advice so many times that I have heard my children repeat it back to me. I think of Leo McCarthy often these days. Especially as I see the deep divisions in our country today. Divisions so deep that our leaders, and in many cases, our own friends and family cannot come together for a conversation without getting into a yelling match or worse. Working for Leo McCarthy provided me opportunities that I could have never imagined possible. I rode in a presidential motorcade with him – imagine no traffic on a freeway in LA. I had tremendous responsibilities overseeing a team of colleagues throughout the state, was lent out to other candidates to run their campaigns, and saw some of my ideas even become laws. I also learned life lessons that have deeply shaped who I am, my involvement in my community and how I run my nutrition practice. I have always felt that Leo approached young people as if he were there to provide a rich soil for us to grow. He planted and tended to the seeds in each of us enabling us to grow and go on to contribute. If he were here today, Leo would have welcomed you into his family as he welcomed me and he would have held you to that same higher standard to dig deeper, learn more, reach out again and again to a wider circle, develop your grit, and lead with integrity, honesty, and courage. When he told me that he was creating this institute. I felt proud and comforted that he was formalizing a process that he lived every day. 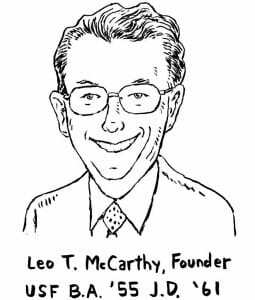 As you continue your journey into helping shape public policy and working toward common good in whatever form that takes know that you now carry the seed that Leo McCarthy planted with in you and with it, all of the responsibilities that it entails. 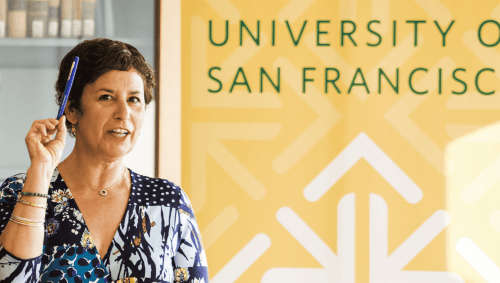 This entry was posted in Academic Year 2018-2019, Leo T. McCarthy Center (LTMC), McCarthy Fellows, Uncategorized, University of San Francisco. Bookmark the permalink.